Lancia 66 made it. They went from Flagstaff up to Las Vegas, and then to Los Angeles. Here is a report from Cory Youngberg in LA, on their arrival and trip in. 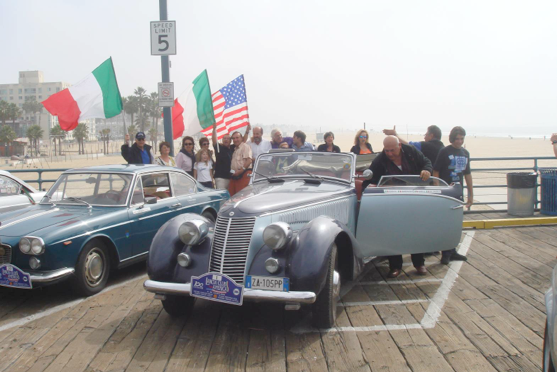 “The Lancias across America arrived in Los Angeles. The first group arrived about noon. (Three Aurelias and a Flaminia) The second group of two 1600cc Fulvias arrived about 5PM. And the last group came in about 6. All cars made it across the desert with the exception of the Flaminia PF Coupe, which lost two tires in Needles California. 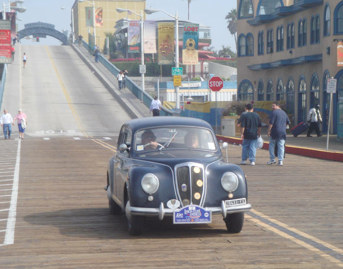 That car is being trucked to Long Beach to be put on a container. It is hard to find 185 by 400 Michelins, or 165 by 400 Michelins, in Needles. The first group in the Aurelias made it in 4hours 30 minutes, which is a good time. The Aurelias B20 coupes ran great. They were able to attend the concours in Las Vegas. The second and third groups of Lancias arrived at their hotel around 5:30 PM. After changing we were off to the San Fernando Valley for a wine mixer, visit to Gary Byrd’s residence and workshop, and off to dinner. Two groups left the hotel. 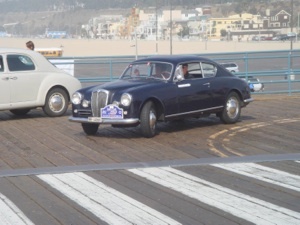 I had two Aurelias following me across town and took three participants in my 1959 Flaminia Berlina. By coincidence the exhaust pipe in the dual exhaust broke just before the muffler, so the Flaminia Berlina was running an open exhaust across town. The Italians didn’t mind too much and commented that the exhaust was “sportivo” The Flaminia and Aurelias made it across town in the worst rush hour traffic that I have seen in years due to an accident blocking the lange. I don’t believe the Italians could believe the congestion. Adan Figueroa brought the second group across town in his Lancia Fulvia GTE Berlina. Eventually everyone made it to the mixer and dinner arranged by Gary Byrd and Paul Tullias at a local French Restaurant. Special menus were printed up for the group with a Lancia theme. I enjoyed following the Aurelias with their beautiful 1940’s styling in my Appia through the mountains and seeing how they briskly glide through the twisty corners with such composure never putting a wheel wrong. It is on these roads particularly that one can appreciate the wonderful gearing of the transmission and understand why the Lancias are such wonderful mountain cars at opposed to typical flat land cars of the period. On the level freeway the Lancias seem to be revving too high, but in the mountains the gearing, handling and braking are fantastic. The 1923 Lambda led the way with similar speed (if not more) and beautiful handling for a 1923 car. The Aurelias and Flaminia’s had to be driven hard to keep up. The Italians were wonderful drivers hardly touching the brakes through to corners and downhill sections, but still driving briskly. 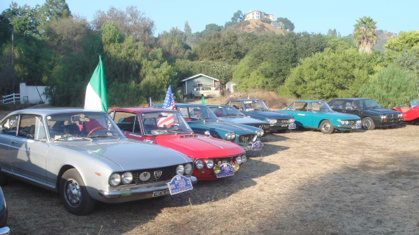 We ended up at a residence and workshop overlooking Topanga canyon where the American Lancia Club hosted a mixer. 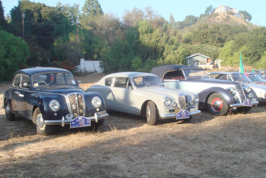 The Italians enjoyed inspecting the workshop with various vintage cars in restoration and a library and residence with four vintage cars stored within especially the 1916 Lancia racing Corsa and 1956 Aurelia spider. I must give credit to Jan Voboril for hosting this mixer and Gary Bryd and Paul Tullius for leading the driving group through the Santa Monica Mountains. That drive was very special.